Gaming is becoming more and more prevalent not only in the lives of teenagers, but also in the web applications we use everyday. For example, Codacademy and Foursquare both use game mechanics like scores, levels and rewards to keep people engaged. Games work because they make people happy. Game researcher, Jane McGonigal calls them 'happiness engines'. I would further add the bicycle as a happiness engine. Biking is on the rise, especially in cities that are adapting their roads to be bike-friendly. New York City is an example of such a place. At the intersection of biking and gaming, SPOKED creates happiness through games that fit into an everyday active lifestyle. All you need is a bike. Tracking and biking are the core of a SPOKED game. Every ride taken during a game by all contestants are drawn on the game board. As time goes on, rides pile on top of each other to form a beautiful piece of art. "I got to see my blue color on the map, and I guess I got a little competitive," Dave commented about his experience in the game, before he revealed his strategies for extending his rides. SPOKED was created for people with under utilized bikes. Bikes that are not used enough for transportation, that is. One of the hardest part of riding is being motivated to get into the habit. A two-week bike game intends to give that motivation through friends and competition, but more importantly allow for a little extra happiness in a normal day. 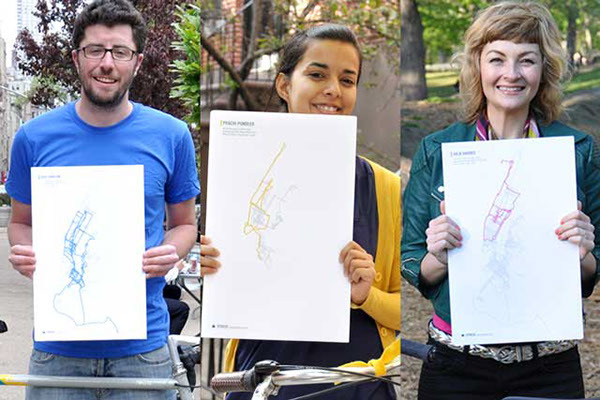 SPOKED contestants with final game posters illustrating their rides during the two weeks compared with teammates and competitors. 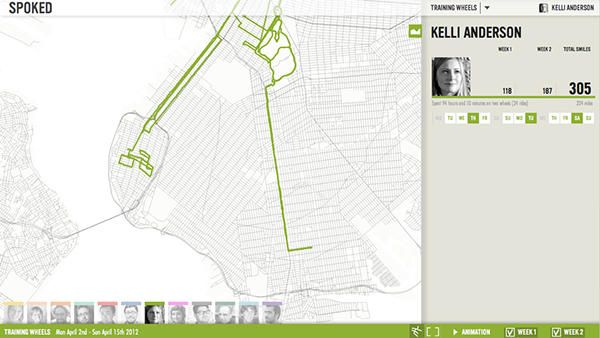 Julie, an committed commuter, took a trip all the way to Jersey to help her team get ahead in the game. Kelli, an artist by nature, got creative and drew a bike with her bike. 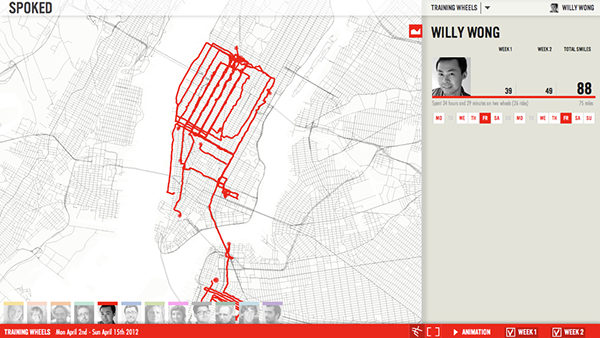 Willy mixed it up every commute with a new avenue. 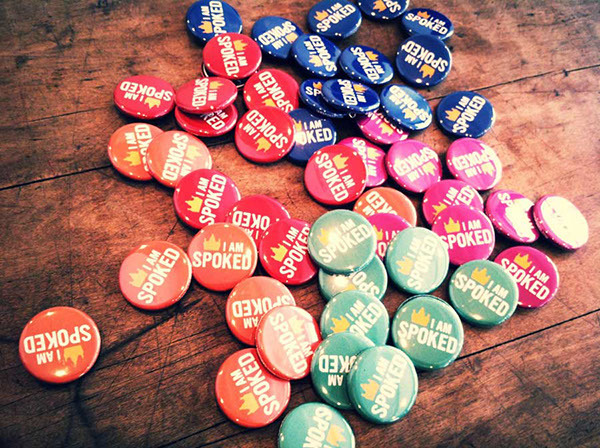 SPOKED was created as a joint thesis project in the SVA Interaction Design program by Carrie Stiens and Kristin Breivik. Yang Yang, worked as the code mastermind and backend developer for SPOKED. 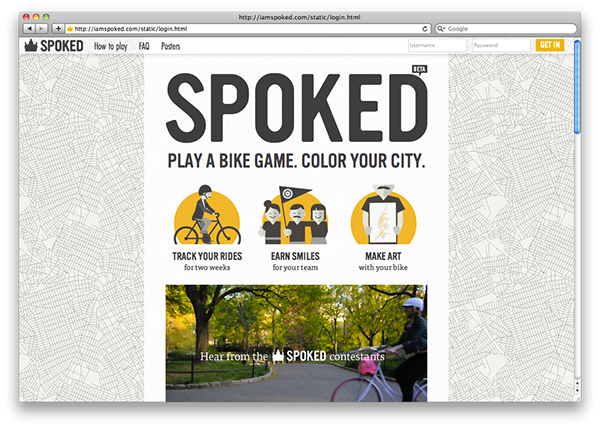 SPOKED is a service that helps you and your friends get on bikes more often through two-week bike games. 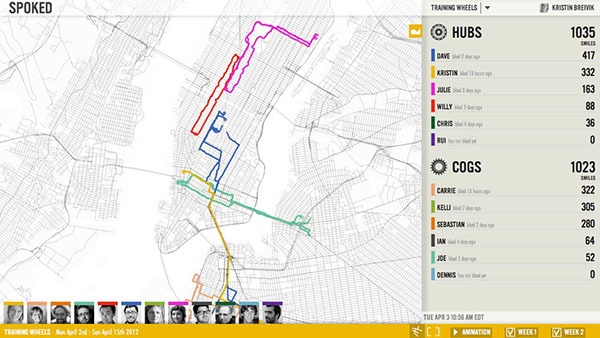 During a game, contestants track their bike rides with a smartphone and send them to SPOKED. 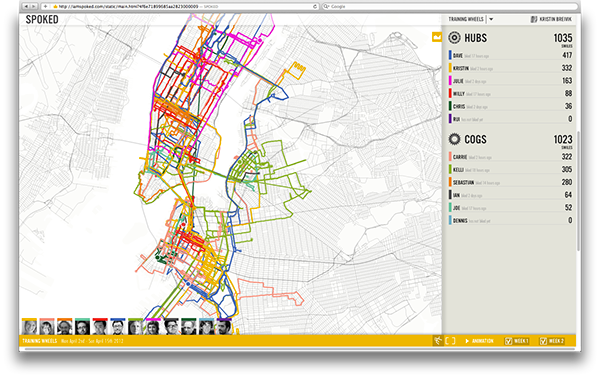 You can see your rides visualized on a communal map. At the end of the game, not only have you biked more than usual, but you’ve made a beautiful artwork together with your friends!